Due to huge-power aircraft development and more electronic devices applied onboard, high heat flow density and uneven thermal distribution are becoming new problems. One new try is adding an air-lubricating oil radiator as the secondary cooling component but there are still few reports on its research. 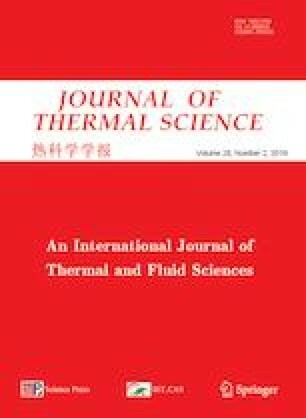 Therefore, this paper proposes a newly-design plate-fin air-lubricating oil radiator different from tube-fin or shell-tube conventionally used in previous engine system. This radiator is arc, and equipped in internal surface of air intake. Numerical and experimental analyses were carried out on fin performance. Their results agreed well with average error of 13% on thermal resistance. Then heat and flow behaviors of oil side were presented with different structures and sizes of flowing passage. According to all research, optimized radiator is gained with fin spacing of 3.76 mm, fin thickness of 2 mm, single flowing path with width of 13 mm and gradient inlet and outlet. Its heat dissipation of 28.35 kW and pressure loss of 2.2 MPa can meet actual working requirements. The research proves an air-lubricating oil radiator with arc structure and layout mode of internal surface to be feasible, which is a new but efficient cooling scheme and can lead to an innovative but wide use in modern aircrafts. The presented work was supported by the Natural Science Foundation of Fujian Province of China (Grant No. 2018D0018), and CAS Key Laboratory of Cryogenics, TIPC (Grant No. CRYO201708). General aviation manufactures association, 2016 General Aviation Statistical Databook & 2017 Industry Outlook, https://doi.org/gama.aero/facts-and-statistics/statistical-databook-and-industry-oulook/, 2017 (accessed on June 6, 2017).